On October 18, 1912, Bulgaria, Greece and Serbia declared war on the Ottoman Empire and their armies, from the Albanian mountains to the Black Sea, were ordered to launch an attack. In retrospect, it could easily be concluded that the war began with the aim of partitioning Macedonia, despite the early claims by the coalition that they fought for "the liberation of Macedonia!" The beginning of the First Balkan War marked the end of years of bargaining between Serbia and Bulgaria over the division of Ottoman territory, Macedonia in particular. In October 1911, the Bulgarian government stated to Serbia that the two governments should "reach an agreement as soon as possible concerning the territory of Macedonia-that is, to determine their share of the cake". It was not a question of the "disputed" territories; Bulgaria would agree that Skopje belonged to Serbia, retaining Solun (Salonica), Bitola and Veles for itself. The outbreak of the Italian-Turkish War in October 1911 favored both by weakening Ottoman power, and on March 13, 1912, after months of intensive discussions, an Agreement of Friendship and Alliance was publicly signed, supplemented by secret clauses. Article two of these clauses provided Serbian recognize of Bulgaria's rights to those territories east of the Rhodopes and the Struma river, and Bulgaria in turn recognizing Serbian rights over territory north and west of Mt. Šar. with 3 districts (Skopje, Solun, Bitola)"
These plans were to be put in effect within three months, when "all territorial gains would be realized by a joint action". The territory between Mt. Šar, the Rhodopes, the archipelago and Ohrid Lake, if the establishment of an autonomous state was not possible in view of "the interests of the Serbian and Bulgarian nationalities" and "other external and internal reasons", would be divided along a line drawn from Golem Vrv (to the north of Kriva Palanka) to Ohrid Lake. On that occasion, the Serbian representatives stated: "We are ready for anything and will take part in any coalition-with God or with the Devil if need be-to protect our vital interests." The Bulgarians already considered that "the Macedonian Bulgarians were lost for our cause, as they set out along their own path". 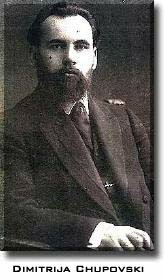 Soon, the Serbian-Bulgarian coalition was extended by signing a agreement between Bulgaria and Greece in May, between Greece and Serbia in September, and between Montenegro and Bulgaria and Serbia-by the beginning of October 1912, the Anti-Ottoman League was formed. In the meantime, the propaganda machines were used to constantly and persistently repeat the necessity of helping their "brother Christians" in their attempts to free themselves from Ottoman slavery. The peoples of Bulgaria, Greece and Serbia were not the only ones who believed in this-a considerable number of Macedonians were convinced of the stated, selfless goals of the League. Beginning in October 1912, fighting took place throughout Macedonia. Following several victories over the Ottoman army, coalition forces occupied Macedonia and forced the Ottoman Empire to seek an armistice, signed on December 4, 1912. Yet, as in many partitions, one party was not satisfied with their share of the spoils. Serbia, denied its proposed outlet to the Adriatic Sea, sought compensation in Macedonia along the Vardar river which the Bulgarians rejected. 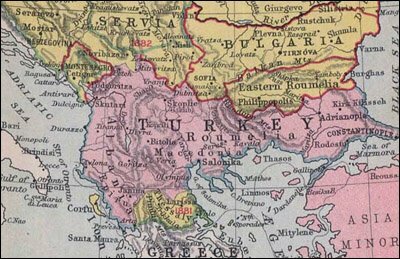 Greece asked for control of Salonica and "a certain part" of the eastern Macedonian territories, which Bulgaria rejected as well. Correspondingly, on June 1, 1913, Serbia and Greece concluded a secret treaty for joint action against Bulgaria; joined by Romania, which sought control over Southern Dobruja. Russia attempted to solve the emerging quarrel in a peaceful manner; but Austria-Hungary, siding with Bulgaria, encouraged flaring tempers in the hope of breaking a coalition directed against the Bulgarians. Anticipating assistance from Vienna, on June 29, 1913, the Bulgarian army attacked its former allies. This Second Balkan War was at first waged entirely on Macedonian soil, but on July 10, Rumania entered the war and four days later the Ottoman Empire joined the general assault on Bulgaria. Faced with four fronts, Bulgarian armies were defeated piecemeal and the government at Sofia was forced to seek peace. The victors of the Second Balkan War did not want to miss the opportunity to imposing conditions on Bulgaria which "would create a just balance" in the Balkans. This included settling accounts among themselves at the expense of Macedonia, taking no account of the ethnic, political and economic unity of the territory through which drew new frontiers for the second time in less than a year. 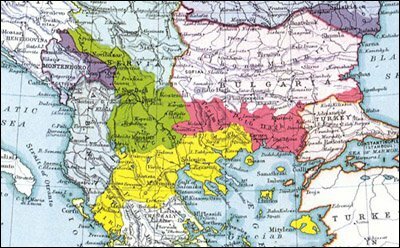 At the beginning of August 1913, the Treaty of Bucharest was signed: the entire "disputed zone" was taken by Serbia, Greece secured its position in Solun (Salonica) and Aegean Macedonia, the Ottomans regained all the territories lost in the First Balkan War to Bulgaria with the exception of Pirin Macedonia, and the Romanians seized Southern Dobruja. and Vardar part of Macedonia"
The events of the two wars and the final partition are the best indications of the limits to which nationalist and chauvinist passions can corrupt humanity. For example, in pursuing the Bulgarian army during the second conflict, Greek forces systematically burnt to the ground all Macedonian villages they encountered, mass-murdering their entire populations. Likewise, when the Greek army entered Kukuš (Kilkis) and occupied surrounding villages, about 400 old people and children were imprisoned and killed. Several dozen distinguished Macedonians were victims of the persecution in Kukuš, previously marked for death as potential hazards for Greek occupation. Specially trained Greek units destroyed over 40 Macedonian villages. About 4,000 refugees from Kukuš had gathered in the village of Akandzheli when on July 6, 1913, a Greek military unit entered the village. Though met with white flags, the village was burnt down and in the massacre which followed 356 refugees were killed, including children and the elderly. In Serez, Greek police imprisoned about 200 Macedonians and subsequently executed them. About 1,000 men were slain in the town of Nigrita alone. 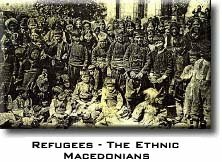 On the whole, in the region of southern Macedonia, the Greeks destroyed 16,000 houses and 100,000 Macedonians were forced to leave their homes and flee to neighboring countries. was never Greek, Bulgarian, nor Serbian before 1913"
Bulgarian armies and Vrhovist bands were not any more scrupulous in respecting human life. In the small town of Dokast, inhabited by Greeks and Turks, the Bulgarians fired 270 out of 570 homes and killed a hundred people. When they occupied the town of Serez for the second time, they torched 4,000 houses out of 6,000 and massacred many of the inhabitants, mainly Turks and Greeks, on the pretext of revenging the slain Macedonian population of the town. Nor did the Serbian "liberators" lag behind in destruction and wanton slaughter throughout Macedonia. In Bitola, Skopje, Štip and Gevgelija, the Serbian army, police and chetniks (guerrillas) committed their own atrocities. Nor were these events to be the last tragic consequences of the Balkan Wars: an enormous number of refugees from Macedonia were compelled by threats and force to leave their homes and flee. About 112,000 refugees sought shelter in Bulgaria, 50,000 of whom were Macedonians. Greece received 157,000 refugees, mostly Turks and Greeks, who settled on the properties of Macedonian refugees. About 1,000 refugees settled on Macedonian territory occupied by Serbia. About half a million people became refugees, driven across newly-created borders-driven from one part of Macedonia to another by the rampaging armies. On March 1, 1913, the Macedonian colony in St. Petersburg sent a memorandum on the independence of Macedonia to the conference of Great Powers in London, along with a geographical-ethnic map of Macedonia made by Dimitrija Čupovski. "Europe is about to make the same mistake as in 1878. Instead of Macedonia being proclaimed an independent state, its liberators decided to divide it among themselves... The Macedonians have gained the right to self-determination through their recent history... A horrible terror now reigns in Macedonia-there are no limits to the 'freedom' of the allies. Not a single Macedonian has the right to travel outside Macedonia and go abroad to protest to the European states. Whoever attempts to do that is either killed or imprisoned. The allied armies have enclosed Macedonia in an iron grip." Two: that, on the basis of a general election, a Macedonian people's assembly be convened in Salonica as soon as possible, to work out the internal organization of the state and define its relations with the neighboring countries." "...Despite vigorous opposition by the Macedonians themselves, the division of Macedonia will undoubtedly lead to internecine blood-shedding among the allies... The Balkan Peninsula is too small for several greater-state ideals to coexist. Only a federal state constituted of all Balkan people, in which Macedonia will be included on an equal footing as an indivisible state, independent in its internal affairs-only such a federation that can provide peaceful coexistence and progress of the Balkan people!" On June 7, 1913, a second memorandum of the Macedonians was sent to the governments and peoples of the combatants of the Balkan Wars, stating that "in the name of natural right, in the name of history ... Macedonia is inhabited by a homogeneous population having its own history, and hence the right to self-determination. Macedonia is to be an independent state, within its natural borders. The Macedonian state is to be a separate equal unit of the Balkan League, with its own church established on the foundations of the ancient Ohrid archbishopric", requesting that a people's representative body be convened in Salonica. This memorandum was signed by members of the Macedonian colony in St. Petersburg. Despite the obvious fact that in the partition of Macedonia a nation had been divided, in the Paris Peace Conferences (June-September, 1919) the Great Powers, protecting their own interests, confirmed with minor alterations only the decisions of the 1913 Treaty of Bucharest. "The participants of the Bucharest Peace Conference (August 1913), at which the partition of Macedonia was performed resulting in tearing up the ethnic tissue of the Macedonian nation so as the geographical and natural entity of Macedonia"
During the conference the Macedonian issue, in one form or another, confronted any possible settlement of World War One's Balkan front. Three proposals were placed before the Committee on the Formation of New States. On June 10, 1919, the Italian delegation proposed that Macedonia be given the status of autonomy within the framework of the Kingdom of the Serbs, Croats and Slovenes. Macedonia would possess an autonomous assembly and the Macedonian governor would be responsible to it, although he would be appointed by the Yugoslav government. Opposed by the French delegation, at the following session of the committee the Italian representative changed the proposal on political autonomy of Macedonia and reduced it to a proposal for administrative self-management with a central council in Bitola. The French delegation, protecting the interests of the Kingdom of the Serbs, Croats and Slovenes (viewed as a key ally in the region) categorically opposed any kind of autonomy for Macedonia and proposed that the Macedonian Question be discussed in terms of minority issues. The treaties of protection for minorities would be a sufficient guarantee of freedom and protection for the population of Macedonia. The British delegation offered in turn a proposal for special control of Macedonia by the League of Nations, in order to reinforce minority guarantees. The insistence of France that the Macedonian Question be removed from the agenda ended culminated in the statement of its delegation that "the Macedonians do not have a clearly defined nationality and the population is divided into parties which, in view of the events, change their character." Supporting the request by Pašič that the new state, the Kingdom of the SCS (Serbs, Croats and Slovenes) be provided with "a strategic border", France upheld Yugoslav control of the region, and any protection for the Macedonians must be limited to the framework of minority rights in general. Unfortunately, the Great Powers had no interest in the voice of the Macedonian-the partition of Macedonia had already been accomplished, and no power seriously endorsed revision of the partition. Accordingly, Greece maintained its lion's share of Macedonian territory, some 35,169 square kilometers; the Kingdom of the Serbs, Croats and Slovenes retained 25,774 square kilometers; and Bulgaria maintained, after minor revision (giving the Strumica districts to the Kingdom of SCS), 6,798 square kilometers. While before the Ilinden Uprising there were an estimated two and a half million people in Macedonia, after the Paris Peace Conference the totaled populations of Aegean (Greek); Pirian (Bulgarian) and Vardar (Yugoslav) Macedonia was 2,028,000, hardly past the two million mark. War and economic collapse had reduced the population of Macedonia by 270,000 people, a negative growth most visible in Aegean Macedonia. In 1896, there were 681,451 inhabitants of Aegean Macedonia, 354,406 of them ethnic Macedonians, 68,000 Greek, 195,000 Turks and about 66,000 of other nationalities. In 1920, on this same territory, the population had dwindled to 584,294 inhabitants, with a Macedonian population reduced by 46,763 to a total of 307,643 and a Greek population of 107,437, an increase of 38,927. In vain were protests, applications, declarations, memorandums or personal appeals by representatives of the Macedonian people to the Peace Conference, the governments of the Great Powers, or to Bulgaria, Serbia and Greece that the Macedonian people should not be considered "an amorphous mass", that "the spiritual unity" of the Macedonian should be respected and Macedonia raised to the rank of "an independent state".